Historical conflict dominates this exhibition of work made in the 1960s and 1970s when Italy faced the emergence of armed guerrilla groups. Michelangelo Pistoletto does not offer ideological positions but instead examines intense passions and high stakes during Italy’s ‘Years of Lead’. Employing his now familiar polished steel panels, the artist incorporates and implicates the viewer within the charged image. As the context recedes into the past, he establishes a dramatic irony whereby the viewer is increasingly removed in time but remains formally present on the surface of the picture and thus our place within a social discourse becomes explicit. 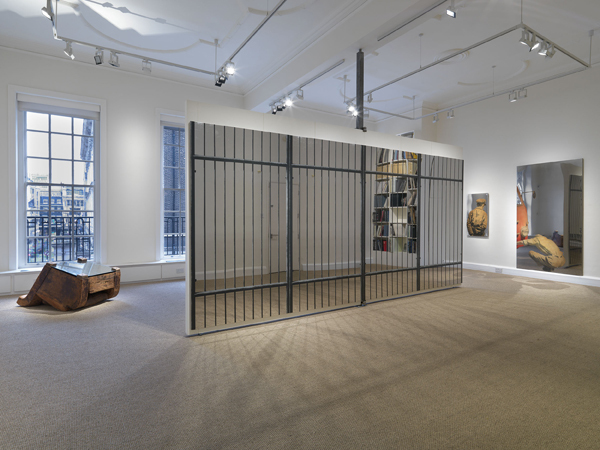 ‘La Gabbia’ (The Cage) 1965 survives as four panels from of a former New York exhibition of 29 pieces on which prison bars are screen-printed. Paradoxically the viewer assumes the role of both prisoner and guard. The eyes gazing at this sequence of bars are reflected back from beyond the grill. As our physical presence animates the work, ‘La Gabbia’ entraps us in ideological and political debate. Within ‘Comizio’ (Rally) 1965, a newspaper photograph of two middle- aged men in suits standing amidst an invisible crowd is copied onto tissue paper and applied to the polished stainless steel. Such scenes would have been familiar to Pistoletto within his native Turin. One figure holds a red flag crowned with a star and such iconic images of revolutionary agitation will undoubtedly resonate for an older generation. This appropriation describes historic struggles for a better world but which now seem anachronistic and tainted with failure. Moving from the street to domestic life, a found armchair (Mobili Capovolti) is turned upside down and a mirror is attached to the underside. What is usually hidden is violently exposed to scrutiny while the viewer is pulled into something that can no longer be narrated at a distance. Mounted on a modest scale, this show revisits Pistoletto’s incisive use of contemporary motifs to analyze social crisis. Today these loaded artworks have become oddly estranged from their origins as they sit within a commercial setting offering the promise of lucrative investment.